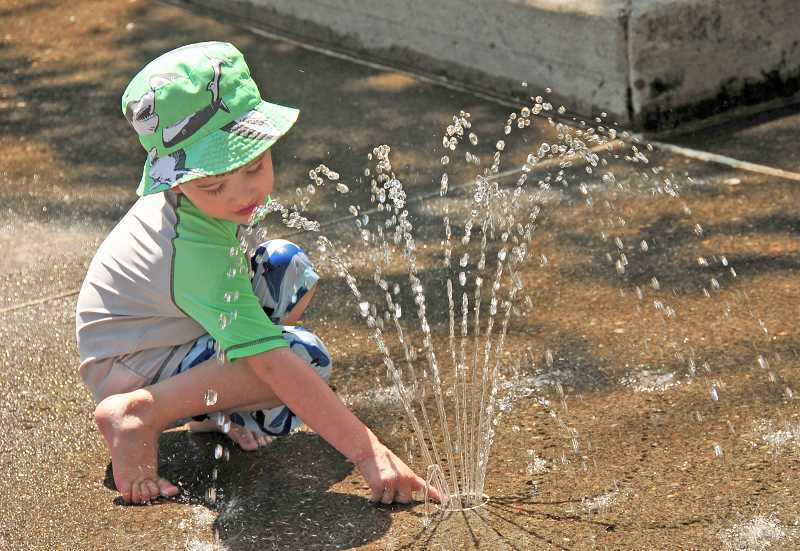 The epicenter of life for small children during summer's unforgiving heat often involves running through one of seven water features maintained by city employees of West Linn and Wilsonville. Staff work every day to ensure equipment is working properly and issues are kept to a minimum. "This year has been very successful; they've been running beautifully," said Matt Baker, Wilsonville's public works supervisor. In the City of Wilsonville there are two splash parks: Murase Plaza Park near the Wilsonville Public Library and Town Center Park in the heart of the city. Larger in population, West Linn has five splash pads — Tanner Creek Park, Willamette Park, Hammerle Park, Robinwood Park and Marylhurst Heights Park — that are scattered throughout the city. For community members with small children, the splash parks seem to be a popular choice. Naomi Nguyen of Wilsonville has two boys and she tries to spend the bearable morning temperatures at local parks and then hit the splash pads during the evening, spending the heat of the day indoors. "There is fun for my 3-year-old and my 6-month-old," said Nguyen, adding that her oldest son can run around in the water and her infant can sit in an inch or two of water and watch the older children play. "I feel like it's much safer than a pool — drowning danger is much lower." The water features in both communities, which are operated under Oregon state pool regulations and are maintained daily, have not experienced many problems this summer except for the five-day Tanner Creek Park closure. "Most of the time they're (back) up the same day (but) it can be a little more challenging on weekends, depending on what staff we have working," said Ken Warner, West Linn assistant parks and recreation director, adding that the Tanner Creek splash pad closure was five days because staff had to order the part that needed to be replaced. "We get a couple of phone calls; (people) wonder why it's broken, just typical things that come in when things don't work. You just briefly explain that sometimes things break and we are doing the best we can." Cherlyn Staten of West Linn remembers the Tanner Creek closure in June and said although she didn't see notifications on the WL Parks and Recreation Department's website about the closure, she detoured with her two-year-old son to Marylhurst Heights and was pleased. "There are so many splash pad options a few miles apart," Staten said. "From my experience, they are typically cleaner, less crowded and helps my fear on toddlers (drowning)." Allison Bartik of West Linn was also disappointed with how long Tanner Creek was closed but said she was glad there were many splash pad options. "My daughter is small so Willamette (Park) suits her play a bit more, but my son loves to run in the large spray at Marylhurst Heights," Bartik said. "I prefer Marylhurst Heights since it is less crowded, and has great shelters that are rarely reserved on weekdays." 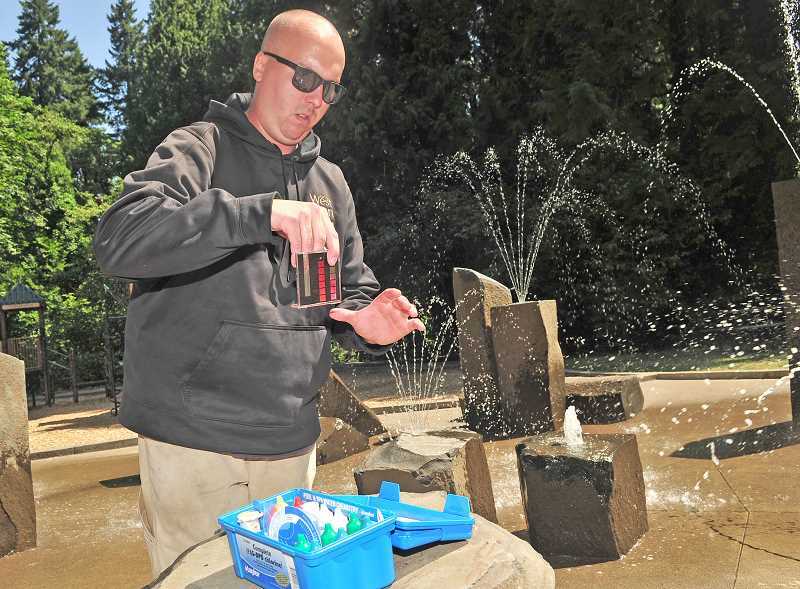 In West Linn when there is an issue with a water feature, Warner said staff communicates through the city and parks and recreation social media outlets or through their websites. "It's not a perfect system," Warner said. "We will also post when they're out of order; we put a sign at a spray park as well." Wilsonville has a slightly different approach. Baker said operators update the recording on their water feature hotline to notify people of closures. They also have signage and workers on site to communicate the problem. While problems with equipment are inevitable, both cities closely monitor the water features every two to four hours. Baker said workers are on site every day at 8 a.m. to clean and prep the water features, making sure the pH levels and water temperature — among other measurements — are appropriate. Last year the Wilsonville Public Works Department slowly started phasing in automated controls so workers didn't have to pull water samples every two hours. Now the department has monitors in their building that will notify them if something is slightly off. Only then will workers will make a trip to the water feature. West Linn has a similar approach but without the monitors in their building. Allison Crumbaker Browning of Wilsonville praises the employees for their dedication to cleanliness and keeping the features up and running smoothly. "The fountains are beautifully maintained, whoever is the primary caretaker does an excellent job," said Crumbaker Browning, who enjoys taking her five-year-old to Town Center Park. "It's a good option because at the park it gets really hot — you can hardly touch the play structures — it's not fun to go down a burning slide. (However) there aren't any decent shaded areas for caretakers to sit in. At the fountains, everyone can cool off, even though lack of shaded areas can be difficult." Warner said one of the reasons splash pads have become so popular with the younger crowd is because wading pools — West Linn had three of them — were deemed illegal by the state about 10 years ago because the wading pools weren't clean enough to comply with state health regulations. "So our community really needed something," said Warner, adding that spray pads are more popular because they're cleaner than wading pools, which had issues with drainage. Next summer, Warner said an additional water feature at Sunset Park is in discussion — something Nguyen would like to see happen in Wilsonville as well, although Wilsonville has no plans to add additional water features. "I think for the most part it's a safe controlled environment; it's regulated by the county ... it's good family fun," Baker said. "Everyone sets up their little area; they come in and enjoy the day." Harmmerle Park: 1505 Lewis St.
Willamette Park: 1100 12th St.